Crafty friends are the best! They inspire and nourish our crafty selves and never ask you to justify your stash or time spent in crafty pursuits. They don’t even blink at the inch thick layer of dust and other neglected household duties because it doesn’t even need saying that crafts are way more important than dusting. One of the things I’ve missed most about Melbourne was the group of crafty friends I met with regularly, The Richmond Knitters. In an ideal world Melbourne would be as close as France is or all my knitting friends would decide that they too would love to come and live in the UK. I am extremely lucky that two of my crafty friends from Melbourne live in Scotland now and that’s really not too far away from me to travel. One of those is Jules or Woollenflower as she’s known on Ravelry. I don’t think I ever mentioned how we originally met on here. It tickles me a bit when I think of it because Jules and I met in a kind of a crafty blind date kind of a way. Sonia had been telling me that I absolutely must meet her friend Jules because we loved the same kind of thing and Katie had been telling Jules that she should meet her friend Melanie because we loved the same kind of thing. We ended up meeting one Monday at the Richmond Knitters knit night and instantly hit ot off. Well, why wouldn’t we? 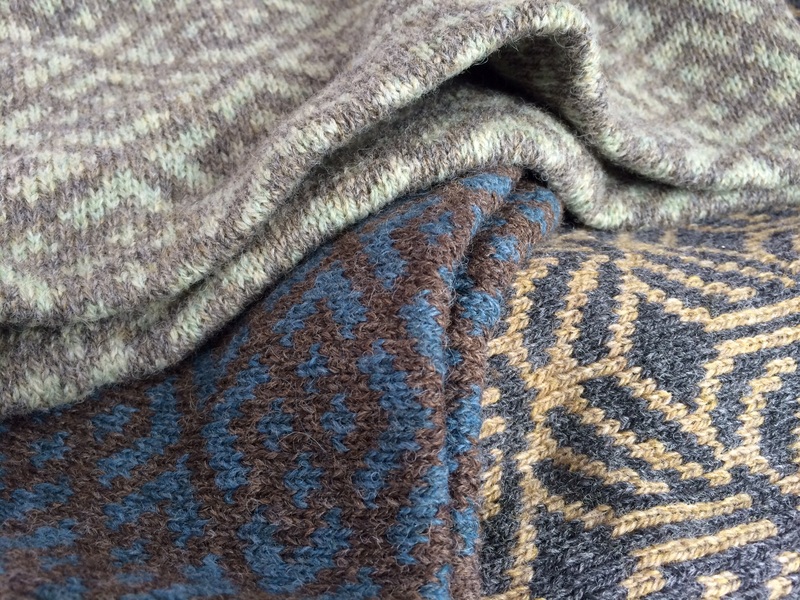 We both love tweed and woolly (some would say scratchy) yarn and soft muted colours. Since then we have spent time dyeing with logwood and woad and mostly sitting, drinking tea, eating cake, chatting, knitting and laughing. Isn’t it lovely that you can have reminders of good times with crafty friends? Every time I touch or look at the yarns we dyed together I’m reminded of those times. 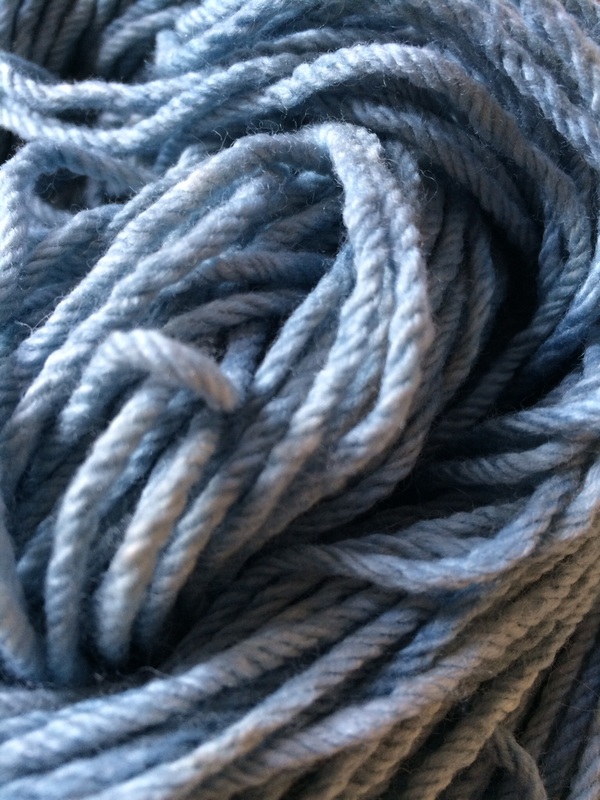 Mmmm, woad dyed yarn. Dyeing with woad still feels like magic alchemy whenever I think of it. When you think about it though, friendship is a kind of magic alchemy too. I must revisit woad sometime maybe I’ll investigate getting some woad plants. I am lucky enough to be the proud owner of three of her cowls, photographed here quite badly and I apologise profusely for not doing them justice. They are warm, stylish and beautifully made, how on Earth could I resist? I managed to narrow it down to three but that was hard work believe me. I know that Jules puts in a lot of work in sourcing the right materials for her pouches and cowls and the attention to detail and quality are very evident. I’ll be buying some of her tweed pouches when they come back in stock but I promise to play nice and let the other people have some too. Though I’m sure I could find a use and justification for one on every colour of both the cowls and pouches without trying too hard. Jules has a professional background in horticulture and this inspires her work. She’s a talented and enthusiastic natural dyer and her photography of plants and landscape are breathtakingly beautiful. Check out her blog and you’ll see I’m right. She is also a generous and patient teacher of knitting techniques having worked in several yarn shops in Melbourne as a knitting teacher. I’m envious of those knitters in Glasgow, Edinburgh and surrounding areas that can readily access her knitting classes at Fluph and Ginger Twist Studios and those in Melbourne who’ll be attending her classes at the Craft Sessions. Jules and I have discussed more dyeing sessions in the future and I’m currently saving avocado skins and walnut shells for that very purpose. There will of course be blog posts about our future dyeing sessions when they occur. I’d like to try dyeing more fibre with plant dyes in the future I think. I will be working this weekend but I wish you all a wonderfully crafty weekend, perhaps with some time spent with wonderfully crafty friends. Oh Melanie, what a lovely post. I think you’re right about friendship being a bit of magic. Thanks for the mention, but I think you were going to meet Jules whether I had a hand in it or not, it was fated. I do feel that we are super blessed at the Richmond Knitters with the wonderful knitters (who become friends) that come along. I miss you too.